Judges in most societies often resort to resolving disputes by means of applying a criterion of reasonableness. 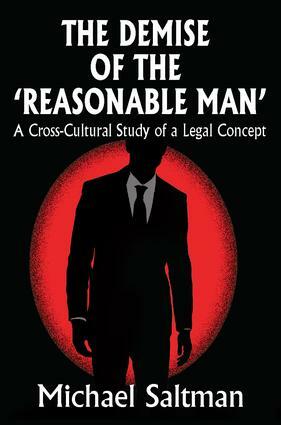 In The Demise of the'Reasonable Man' Michael Saltman explores the ways in which reasonableness varies from one legal culture to another, defined by the relative presence or absence of centralized political power. In non-politically centralized societies, Saltman says, judges seek meanings underlying human behavior, and try to place reasonableness within a societal and cultural context. This is possible because primitive societies are relatively homogenous in their values and tend towards consensus when determining what constitutes reasonable behavior. In contrast, modern judges resort to standards of reasonableness only when the legal standard is unclear. Saltman contrasts judges in politically centralized societies, who, in the absence of such consensus, have the authority to determine, on the basis of that authority, what constitutes reasonableness. This rich volume references case studies drawn from ethnographic fieldwork, historical sources, and law reports to demonstrate differences in judicial attitudes toward reasonableness. Scandinavian and American Legal Realism: Measures of Reasonableness?